Interactive eBooks, refereed. New volumes are underway. Spatial Synthesis: Volume II, Book 4. Making It Clear: The Importance of Transparency, Again. Sandra Arlinghaus with input from John D. Nystuen and Diana Sammataro. March 21, 2009. Deep Blue link to the file. Spatial Synthesis: Volume II, Book 2. Making It Clear: The Importance of Transparency, October 31, 2008 . Sandra Arlinghaus. Spatial Synthesis, Volume II, Book 1. Scientific, Planning, Humanitarian, and Teaching Applications, From DevInfo to Google Earth. Sandra Arlinghaus. September 2008. 3D Atlas of Ann Arbor, 3rd Edition , Sandra Lach Arlinghaus with input from others noted throughout. June 2007. 3D Atlas of Ann Arbor, 2nd Edition. Sandra Lach Arlinghaus, November, 2006. 3D Atlas of Ann Arbor, 1st Edition. Editor and principal author: Sandra Lach Arlinghaus with co-authors noted throughout the files. June, 2006. Student Series--work primarily of students but also with instructor "models" and "comment" included. Please feel free to nominate work to be included in this section (from any university). Unless a special arrangement is made, links are to original sites; thus, if work is removed, links will not work. Students retain all rights to their own work and all responsibility for it. University of Michigan, 3D Modeling of Campus Competition, Directed Study, School of Natural Resources and Environment. See Solstice link for models in "Awards" section. Spring half-term, 2007. University of Michigan, College of Engineering, Virtual Reality Series of Group Projects, 1996-2006. University of Michigan, School of Natural Resources and Environment, Spatial Analysis, Theory and Practice: Experimental, 1996-97; regular, 1998-99. Monograph Series, Classic eBooks in pdf format, refereed. Revised, interactive versions are underway. All materials copyrighted; all rights reserved, worldwide. Earlier Monographs were bound in the classic cover shown here and in earlier versions of the same. Now all are available in eBook (paperless) form. Entire books are reproduced in signed Portable Document Files, with the "signature" from IMaGe certifying that the electronic copy is one made directly from the original document. Use Adobe Acrobat Reader to read these eBooks; animation is not supported. Thus, later issues of Solstice, contemporary eBooks, and other documents are available only in formats that do support animation, applets, virtual reality, and various other features. The means of original production is noted next to the book title. Early copies of Solstice were typeset using TeX; the pdfs of printouts from the TeX file are shown here; to see the original TeX file, go to the Solstice Archive. Readers were sent, via electronic mail, the electronic TeX files, with instructions to print out their own typeset journal if they wished (using their own printing equipment). 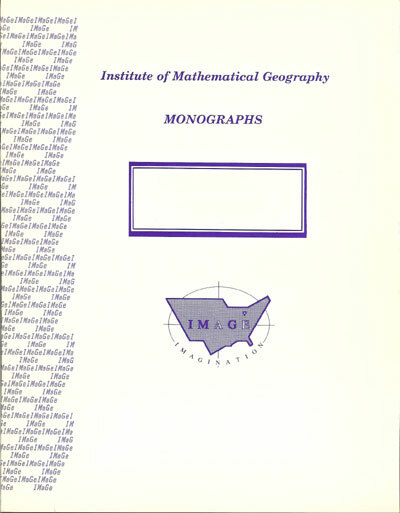 Click on the monograph numeral below to go directly to the eBook. Mathematical Geography and Global Art: the Mathematics of David Barr's `Four Corners Project'. 2009: Link to Supplementary Materials. Pierre Hanjoul, Hubert Beguin, and Jean-Claude Thill, 1988. Theoretical Market Areas Under Euclidean Distance. Keith J. Tinkler, Editor, 1988. With contributions by Keith J. Tinkler, John D. Nystuen, and Michael F. Dacey. The Urban Rank-size Hierarchy: A Mathematical Interpretation. An Atlas of Steiner Networks. Simulating K=3 Christaller Central Place Structures: An Algorithm Using A Constant Elasticity of Substitution Consumption Function. Sandra L. Arlinghaus and John D. Nystuen, 1990. Environmental Effects on Bus Durability. Daniel A. Griffith, Editor, 1990. Sandra L. Arlinghaus, Editor, 1990. Solstice: An Electronic Journal of Geography and Mathematics, Volume I. Scale and dimension: their logical harmony, S. L. Arlinghaus. Sandra L. Arlinghaus, Editor, 1991. Solstice: An Electronic Journal of Geography and Mathematics, Volume II. Front Matter, Number 1, Volume II. The Spatial Shadow: Light and Dark---Whole and Part. S. Arlinghaus, D. Barr, J. Nystuen. Construction Zone: Logistic Curve. S. Arlinghaus. Construction Zone: Spatial Theory lectures. S. Arlinghaus. End Matter, Number 1, Volume II. Front Matter, Number 2, Volume II. Reprint: Proof, Truth, and Confusion. S. Mac Lane. End Matter, Number 2, Volume II. Sandra L. Arlinghaus, Editor, 1992. Solstice: An Electronic Journal of Geography and Mathematics,. Volume III. Front Matter, Number 1, Volume III. The Quadratic World of Kinematic Waves. S. Arlinghaus, J. Nystuen, M. Woldenberg. End Matter, Number 1, Volume III. Front Matter, Number 2, Volume III. Reprint: Where Are We? Comments on the Concept of the "Center of Population". Frank Barmore. The Pelt of the Earth: An Essay on Reactive Diffusion. S. Arlinghaus, J. Nystuen. End Matter, Number 2, Volume III. Sandra L. Arlinghaus, Editor, 1993. Solstice: An Electronic Journal of Geography and Mathematics,. Volume IV. Front Matter, Number 1, Volume IV. Reprint: The Earth Isn't Flat. And It Isn't Round Either: Some Significant and Little Known Effects of the Earth's Ellipsoidal Shape. F. Barmore. Sum Graphs and Geographic Information. S. Arlinghaus, W. Arlinghaus, F. Harary. End Matter, Number 1, Volume IV. Front Matter, Number 2, Volume IV. End Matter, Number 2, Volume IV. The Cause of Location of Roads in Maryland: A Study in Cartographic Logic. Added link to folder containing figures. Sandra L. Arlinghaus, Editor, 1994. Solstice: An Electronic Journal of Geography and Mathematics,. Volume V.
Front Matter, Number 1, Volume V.
Reprint: Getting Infrastructure Built, Virginia Ainslie and Jack Licate. Reprint: Center Here; Center There; Center, Center Everywhere, Frank Barmore. End Matter, Number 1, Volume V.
Front Matter, Number 2, Volume V.
The Paris Metro: Is its Graph Planar? S. Arlinghaus, W. Arlinghaus, F. Harary. Reprint: Imperfections in the Uniform Plane, M. Dacey. End Matter, Number 2, Volume V.
Sandra L. Arlinghaus, Editor, 1995. Solstice: An Electronic Journal of Geography and Mathematics, Volume VI. Sandra L. Arlinghaus, Editor, 1996. Solstice: An Electronic Journal of Geography and Mathematics, Volume VII. Solstice: An Electronic Journal of Geography and Mathematics, Volume VIII. Solstice: An Electronic Journal of Geography and Mathematics, Volume IX. Book Review by John D. Nystuen: The Universe Below by William J. Broad.